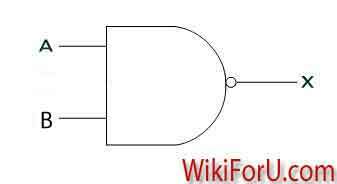 The NAND gate is just an modified version of AND gate. 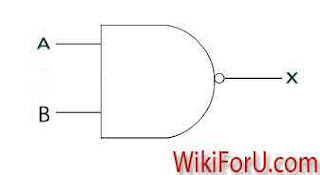 It does the same function as that of AND gate, but one difference is that it also inverts the output. That is if output is one, it will give zero and if output is zero, it will show 1. 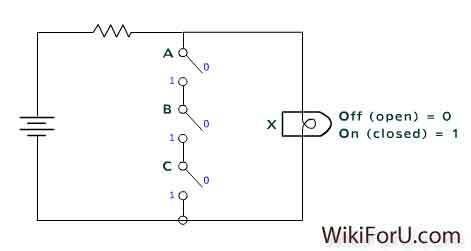 This logic gate may have one, two or more inputs and only one output. NAND Gate gives zero at output when all the inputs are high or one. And it gives one or high at output when all the inputs are zero or low. 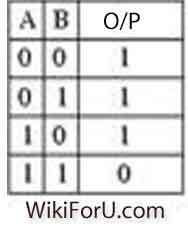 Consider the truth table of NAND Gate given below to know deeply. When both inputs are low or zero(A is zero and B is also Zero), it gives high or one at output. When One is high and other is low(A is low and B is high or A is low and B is high), It gives high at output. When both inputs are high, it gives zero (also known as OFF, low) at output. Three switch keys A,B and C in above diagram are referred as three inputs. The bulb marked as X is showing output. Closed switch keys represents high or one and opened switch keys are represents as low inputs. The output is high or one when the bulb or LED glows and output is zero or low when the Led doesn't glow. Bulb doesn't glow when all the switch keys are closed that is inputs are high. Otherwise it will glow at all other inputs. The representation is same as that of AND gate, except that the bar at inputs. X is equal to A and B not. Which tells us that the output will not 1 or high when all two inputs are at high or one.